Jewish Democrat group: Chuck Hagel is friendlier to Israel than Rand Paul is. How Can You Condemn Rand Paul and Endorse Chuck Hagel? Let’s Ask the Leading Democratic Jewish Group. 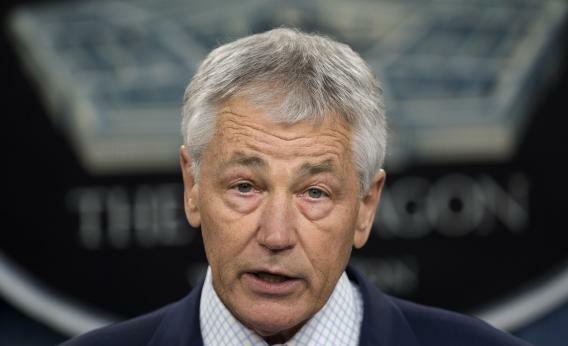 US Secretary of Defense Chuck Hagel speaks on March 15, 2013, inside the media briefing room of the Pentagon, in Washingon, DC. When Chuck Hagel was a senator considering a run for president, the National Jewish Democratic Council condemned him. In 2009, when Hagel was first floated as a possible Obama nominee, then-NJDC head Ira Forman said this would be unacceptable. And then Hagel became an actual nominee and the NJDC gave him a blessing. It’s in that context that Breitbart.com scores a pretty clean hit on the NJDC. Its new head, Aaron Keyak, condemns Paul’s out-there votes on Israel—just like Republicans condemned Hagel’s votes! Senator Paul has called multiple times to cut and end American aid to Israel, and has refused to rule out a containment strategy vis-à-vis Iran. Paul’s misguided foreign policy views are nothing short of dangerous, and his growing legitimacy among the GOP’s base is only another reason why the vast majority of Jewish Americans consistently support the Democratic Party. “Nothing Paul has said remotely compares to Hagel’s statements on Israel,” writes Breitbart’s William Bigelow. That’s why, if you’re a certain kind of Hagel supporter, the NJDC didn’t need to go there. The anti-Hagel campaign was predicated on the idea that any criticism of Israel was suspicious, if not downright anti-Semitic. Hagel called the 2006 Lebanon conflict a “sickening slaughter on both sides”—Ted Cruz said that Hagel was accusing Israelis of slaughter. Hagel didn’t vote for a resolution condemning Iran—Republicans said he basically endorsed Iran’s government. This was disheartening for critics of Israel’s policies, who are constantly accused of anti-Semitism. Hagel’s win made them think you could criticize the Jewish state and live to tell about it. But the NJDC’s closing the loop. NJDC was encouraged by and applaud Senator Hagel’s statements during the nomination process in strong support of preventing Iran from acquiring nuclear weapons and against a policy of containment as well as his clear understanding of the importance of achieving the two-state solution. NJDC know that Secretary Hagel will support President Obama on these issues that are critically important to the Jewish community. In the meantime, Senator Paul’s Republican apologists need to answer for his votes and actions as a leader of their party – and potential Republican nominee for President. That’s what my comments spoke to and I have yet to hear them substantively respond to our statement. Concerning one of the most important policy chalegenges of our time, Senator Hagel and Preisdent Obama have both rejected a policy of containment in preventing Iran from acquiring nuclear weapons. Senator Paul hasn’t.